Mother’s Day Crochet Craft Ideas – Say it With Yarn! It’s funny how a skinny strand of fiber can turn into a beautiful work of art, and with Mother’s Day just around the bend, there are so many great yarn designs available! You can surprise your mom with a personal handmade piece that will brighten her day. Why not make it from the heart? 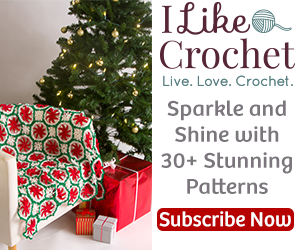 We have come up with a few perfect crochet gift ideas that won’t take long to make, and will add a special touch and smile to her day! The first design is by Lauren Brown – The Daisy in the Center Granny Heart. This pattern is a simple one, but you will go between two different sites to make the complete project. Not only flowers, but hearts, too! You will LOVE how these turn out! Perfect! The Oh My Comfy Cozy is a great gift! It works up quite fast and is also an easy pattern. Not only is this a cozy, but it’s a coaster too! With this sleek mesh design & a fabulous zig zag trim to top off this project, you will be giving mom a gift she can use, year after year on those chilly mornings! The last gift idea I am going to share with you, is a pattern from Attic 24 called Birdie Decoration. I had made a video of this some time back on my Power Hour Projects vlog, which you can find this particular video walkthrough by clicking here. I absolutely loved this pattern. They take very little time to make, and there are so many cute things you can do with these… a wreath of different sized birds, you could take the birds and hang them at different lengths, then string some sound makers through the middle… metal bits, beads, whatever you choose for the perfect wind chime! These are just a few, fun ideas for a Mother’s Day gift. I hope that all of you Mamas out there have an amazingly wonderful Mother’s Day, filled with sunshine and more importantly, filled with love from those perfect little creations of your own… Your babies! I realize that this is going out a little late, there has been a lot going on here in my crazy kid filled home, so these gifts are intended for that last minute…. NOT last thought, just for that special add on or touch to making your Mother’s Day a special one!